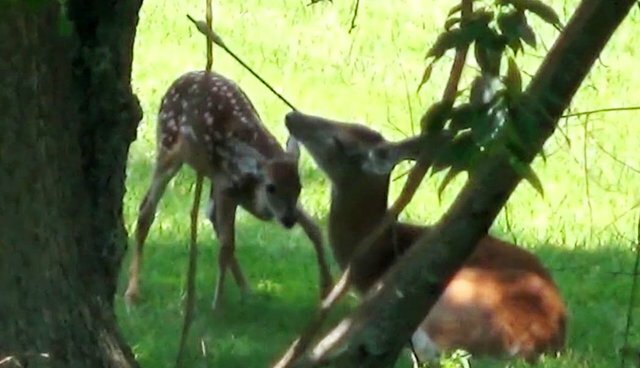 A dedicated mother deer who survived for nearly a year with an arrow lodged in her face has finally gotten the help she so desperately needed. The doe, named Grace, was first spotted in New Jersey last November carrying that unmistakable relic from a recent near-death experience at the hands of a bow hunter. Incredibly, even after the attempt on her life and the cumbersome arrow it left behind, Grace continued to persevere in the wild, even giving birth to a fawn in her injured state. Footage taken just last month shows Grace continuing to raise her offspring, who appears well taken care of despite his mother's condition. Wildlife officials had initially tried to track Grace down to remove the arrow, but their efforts were fruitless. Still, nine months later, the deer's painful plight wasn't forgotten by those who knew she still needed to be helped. A petition was launched on Care2.org urging state Department of Environmental Protection officers to act - and the response was overwhelming. More than 100,000 people added their signatures on Grace's behalf, an outpouring of support which ultimately spurred officials to take action once and for all. On Tuesday, New Jersey Division of Fish and Wildlife (DFW) announced that it had succeeded in tracking Grace down and was finally able to help right the wrong she'd been made to endure for so long. After tranquilizing her with a dart, experts carefully removed the arrow shaft from her face, opting to leave the arrow head in place since her flesh had healed around it. Fortunately, both Grace and her fawn were found to be healthy and were released back into the wild. Though her maternal devotion kept her going despite the arrow she'd had to carry, now she can once again thrive - a happy ending made possible because of folks who refused to stop caring. 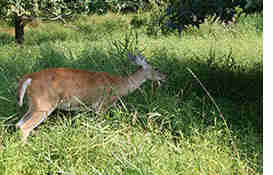 "We thank all of the New Jersey residents and people from all over the world who have expressed concern about the deer, as well as local residents who have been very helpful in providing information on her movements throughout the community and even set up bait stations on their properties," said DFW director David Chanda. "Tracking the whereabouts of any single animal is difficult under any circumstances, and this doe was no exception."